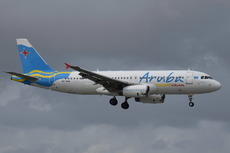 An Aruba Airlines Airbus A320-200, registration P4-AAA, flight AG820, from Miami International Airport (MIA), Florida, USA, to Oranjestad-Queen Beatrix International Airport (AUA), Aruba, powered by two International Aero Engines (IAE) V2527 turbofan engines experienced a separation of the outboard fan cowl from the right-hand engine during takeoff. The flight crew was unaware of any anomalies until a passenger alerted the cabin crew of what he saw and the cabin crew relayed the message to the flight crew. The flight crew leveled off at FL220 to assess the damage to the airplane. The crew was not sure if the panel had detached completely or was not visible from inside the airplane. All systems appeared normal in the cockpit but as a precaution the crew elected to return to Miami. The flight had an uneventful landing on runway 09 at Miami Airport about 40 minutes after departure. There were no injuries. The aircraft sustained damage to the engine, engine pylon, right main landing gear, right main landing gear door and right fuselage. The night prior to the incident the airplane was in maintenance where mechanics were completing a routine weekly check. Part of the weekly check was to open the fan cowl doors to inspect the Integrated Drive Generator (IDG). Following the maintenance check, the cowl doors were closed and latched. bent down and checked that it was flush and latched. The National Transportation Safety Board determines the probable cause(s) of this incident to be: the incorrect latching of the #2 Engine Fan Cowl following a routine maintenance check that resulted in separation of the cowl during takeoff.